This month we would like to congratulate the Brush Creek 4-H Club for being awarded the Nebraska 4-H Club of the Month for January 2018. This club from Atkinson, in Holt County, has truly made a difference in its community. The club is dedicated to building strong citizenship and teamwork through various activities. The Brush Creek 4-H Club from Atkinson has a total of 60 members. 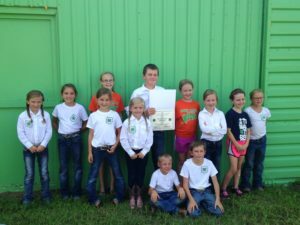 Many are third and fourth generation 4-H members. The club leaders, Linda Olson and Barb Shane, have both been leaders for more than 25 years. They served as club leaders when their own children were in 4-H. They began leading the club again in 2010 so that their grandchildren would be able to belong to the same club that their parents did. Since then, the club has seen great growth. The club has ten regular meetings and does several service projects throughout the year. Their meetings are very traditional, with youth leaders conducting the meeting, saying the pledges, and doing demonstrations. The club continues to clean up the same three miles of road ditches that they have for the past 20 years in the Adopt-a-Highway program. They spend one day each year at the fairgrounds cleaning and getting a building ready prior to the county fair. The club also helps with BINGO at Parkside Manor, the local assisted living center, each year. During National 4-H Week Brush Creek members work to encourage youth to join 4-H by hosting 4-H trivia on the radio morning show and giving away prizes. Additionally, they serve lunch at a local horse show once a year as a fund raiser, and with that money they have donated trophies each year to the county fair. Sadly, this year one of the club families lost their mother due to cancer, and another family lost their father. To show its support, the club purchased these families a tree for a memorial. No Comments to "January 2018 Club of the Month"